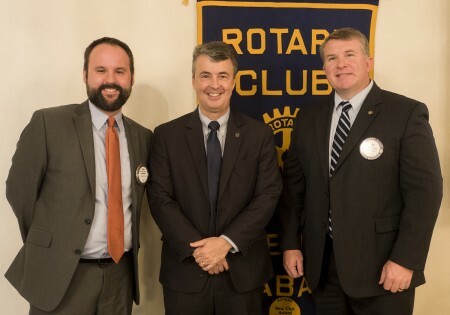 At its meeting on Wednesday, Nov. 1, the Auburn Rotary Club hosted Attorney General Steve Marshall (center), who spoke to Rotarians about the work of the state’s Attorney General’s Office and its partnership with law enforcement throughout the state to combat the growing opioid epidemic. Pictured with Marshall is Club President Chris Warren (left), and program host and Alabama District 79 State Representative Joe Lovvorn (right). The Auburn Rotary Club meets each Wednesday from noon to 1 p.m. at Saugahatchee Country Club. For more information about the Auburn Rotary Club or how to become a member, visit www.auburnrotaryclub.com.